PORTABLE LED ROPE LIGHTS are used in Confined Space Entry applications to light the path ways for safety egress. 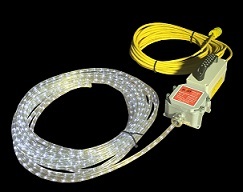 Rope lights come in 50′ and 100′ lengths and operate off of 12 volt or 120 volt power. Rope lights are environmentally rated for wet-locations only. Not to be use in Explosion Proof apps. The LED rope is UL certified and is assembled by a UL Certified electrical assembler. The LED puts out a sold cool white light with no glare. Easy on workers eyes. Scaffold builder have wrapped rope lights around the main scaffold buck section like a Christmas tree so when main buck is moved up or down within tanks the rope lights produce a bright soft light from which trade craft workers can work off of. Improves safety working conditions and produces a more effective works platform. Rope light product .9 watts of light per foot. Extremely light weight and easy to put in position to work.